The only real positives that could be taken out of the Knicks beating to the Sixers in Philly last night is that they have to have a short memory and bounce back today. The Knicks return home after a couple of Atlantic Division road games to take on the Hawks, who currently sit in sixth place in the East, two games behind the Knicks. After a gutsy and much needed victory over the Celtics on Thursday night, the Knicks laid an egg in Philadelphia last night. They lost to the lowly Sixers 97-80 in a game where the ‘Bockers seemed to be indifferent. It was the return of Raymond Felton to the lineup but that didn’t spark much as the Knicks couldn’t knock down any open shots. It was the first time we caught a glimpse of the Felton-Kidd-Shump-Melo-Chandler lineup, but it looked rusty as expected with Felton and Shumpert still working themselves back. A bright spot from the game in Philly was Amar’e Stoudemire’s play off the bench. After scoring 15 points against Brooklyn and then Boston, STAT dropped in 20 against the Sixers. Even though Melo outscored him as he poured in 25 points, Stoudemire was the Knicks lone bright spot offensively last night. His improvement from game to game, not only offensively but he has been been more aggressive on the glass and on defense, is something that is encouraging going forward for the Knicks. One thing that isn’t encouraging is the shooting slump that J.R. Smith has found himself in. His field-goal percentage has dropped to under 40% on the season, and he seems to be lost offensively recently. Smith went 0-8 from the field last night and didn’t score a single point. That followed a 3-16 performance against the Celtics, a 7-19 performance against the Nets, a 6-15 shooting night in London against the Pistons, and a dismal 3-11 shooting against the Hornets. It has been a real tough stretch for Smith who many people believed should have been an all-star. J.R needs to regain his shooting stroke and stop forcing up awful shots in transition and the half court. I think he gets it going again today, starting on the defensive end to get himself an easy bucket. Felton looked rusty last night, but at least we saw one Felton to Chandler alley-oop that we became so accustomed to seeing. The Knicks host the Hawks today who have won three straight games, including a 27-point comeback against the Celtics the other night. 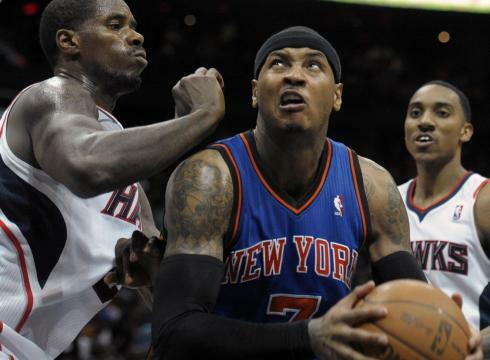 The Knicks have beaten the Hawks four of the past five meetings, and need to get back on track against them today. The key will be keeping the Hawks off the boards who are led by Al Horford, Josh Smith and ZaZa Pachulia. The Knicks have been improving their rebounding on the defensive end over the past few weeks, and as weird as it sounds, Stoudemire has helped provide some rebounding help. The Hawks leading scorer is the versatile Josh Smith who averages 16.9 points per game, but the more important defensive matchup for the Knicks is Felton on Jeff Teague. Even before the injury the Knicks and Felton had trouble keeping the opposing point guard out of the point. Last night was a prime example as Jrue Holiday did whatever he wanted en route to scoring 35 points in the blowout. Teague is another extremely quick point guard who can get in the paint and cause havoc. Teague averages 13.4 points and 6.7 assists per game, and the Knicks need to keep him in check today.